Gail Huddleson has been editing documentaries in the San Francisco Bay Area for over 15 years. Her work has aired on PBS, The National Geographic Channel, Al Jazeera America, and has screened at film festivals across the US. She spent her 20s traveling, and teaching English abroad. Stumbling across a career aptitude test, she was told that she was best suited to be a writer, a carpenter, or an artist. Only in retrospect did she realize that, if you could blend those three occupations together, you’d end up with the job of an editor. Gail earned a Master’s Degree from the Stanford University Documentary Film Program. She received the Guild Award from the Princess Grace Foundation in support of her thesis film, My Roots are Buried Here, which she shot on film and cut on a flatbed. Over the years, she has worked with Kikim Media many documentaries, including Muhammad: Legacy of a Prophet, FRONTLINE’S My Father, My Brother, and Me, In Defense of Food, and The Botany of Desire, for which she was nominated for an Emmy Award for Outstanding Achievement in a Craft: Editing. 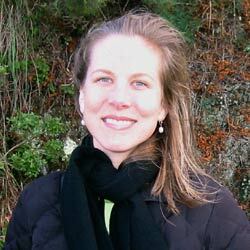 Gail resides in San Francisco with her husband and young daughter.